As Halloween gets creepily close, the season for famous haunts is heating up. 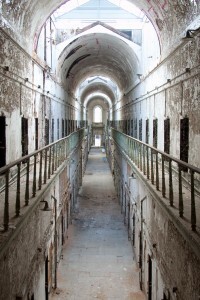 Recently, I took a trip – my second one actually – to Eastern State Penitentiary, a historic landmark in Philadelphia that was, in its prime, the world’s first actual Penitentiary. But, if you’re really interested in the real, genuine spookiness of this place, then you might want to take a day tour, which is offered daily, year-round. ?The concept of this place of rehabilitation was straightforward and earnest, but its history leaves a lot to wonder, as does the creepily dilapidated nature of the structure as it stands today.